I have a splash screen on a timer. My problem is that before I finish() my activity I need to check that the next activity has started because a system dialogue box pops-up and I only want to finish(); once the user has selected an option from the dialogue box? I know that there are many questions on how to see if your activity is in the foreground but I do not know if this allows for dialogue boxes on top of the activity too. EDIT: I have tried just not using finish() but then my activity can be gone back to in the stack of applications which I am trying to avoid. The right solution (credits go to Dan, CommonsWare and NeTeInStEiN) Track visibility of your application by yourself using Activity.onPause, Activity.onResume methods. Store "visibility" status in some other class. Good choices are your own implementation of the Application or a Service (there are also a few variations of this solution if you'd like to check activity visibility from the service). In your finish() method, you want to use isActivityVisible() to check if the activity is visible or not. There you can also check if the user has selected an option or not. Continue when both conditions are met. The source also mentions two wrong solutions...so avoid doing that. That's exactly the difference between onPause and onStop events of the activity as described in the Activity class documentation. If I understand you correctly, what you want to do is call finish() from your activity onStop to terminate it. 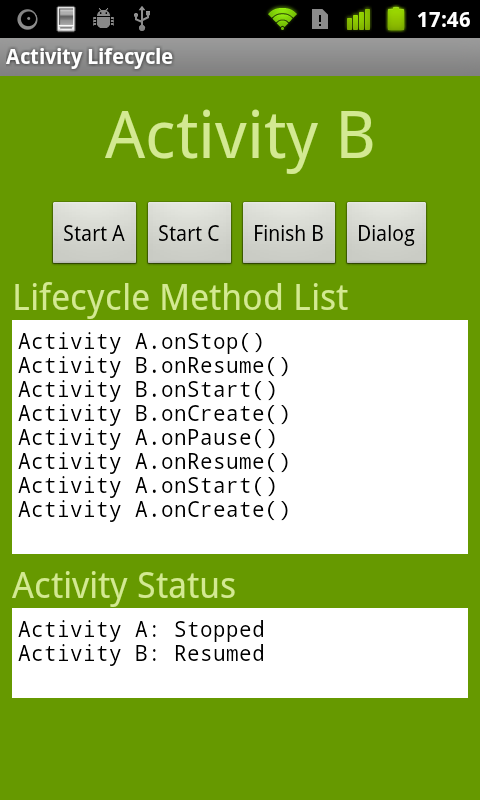 See the attached image of the Activity Lifecycle Demo App. This is how it looks like when Activity B is launched from Activity A. The order of events is from bottom to top so you can see that Activity A onStop is called after Activity B onResume was already called. In case a dialog is shown your activity is dimmed in the background and only onPause is called. Activity::hasWindowFocus() returns you the boolean you need. // Activity is on background. Here is an example class to check your activites' visibility from wherever you are. Remember that if you show a dialog, the result will be false since the dialog will have the main focus. Other than that it's really handy and more reliable than suggested solutions. Use Application when you need to share / store states accross activities. Fetch the running process list with ActivityManager.getRunningAppProcesses() and filter the result list to check for the desired RunningAppProcessInfo and check its "importance"
You can read more in the documenation to understand what happened under the hood. which uses very simple logic and works fine with all android API level. I think I have better solution. Because you can build in simply MyApplication.activityResumed(); to every Activity by one extend. Finally, when you crate new Activity, you can simply extends it by ActivityBase instead of Activity. For me It's better method cause you have to just remember about extend by ActivityBase. In addition you can expand your base function in future. In my case I added receivers for my service and alerts about network in one class. where all activity instance which is currently displayed on screen can be found, just check whether Your Activity is on Screen or not by the above method. did you try not calling finish, and putting "android:noHistory="true" in the manifest? this will prevent the activity from going to the stack. I have to say your workflow is not in a standard Android way. In Android, you don't need to finish() your activity if you want to open another activity from Intent. 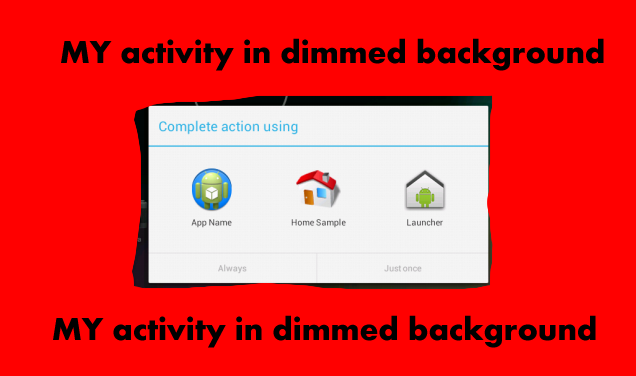 As for user's convenience, Android allows user to use 'back' key to go back from the activity that you opened to your app. So just let the system stop you activity and save anything need to when you activity is called back. Then you can use isAnyActivityVisible() method of your MyAppActivityCallbacks instance everywhere! One possible solution might be setting a flag while showing the system-dialog and then in the onStop method of the activity life-cycle, check for the flag, if true, finish the activity. //notice the string sent to the intent, it will be used to register a receiver! //notice the string sent to the intent filter, this is where you tell the BroadcastManager which broadcasts you want to listen to! NOTE that you could use a constant or a string resource for the "broadcast identifier" string. If you use finish() just to avoid new app to starts in the stack (task) of you app, you can use Intent.FLAG_ACTIVITY_NEW_TASK flag, when starting new application and do not call finish() at all. According to the documentation, this is the flag to be used to implement a "launcher" style behavior. Use these methods inside of an Activity. Returns true if the final onDestroy() call has been made on the Activity, so this instance is now dead. Check to see whether this activity is in the process of finishing, either because you called finish() on it or someone else has requested that it finished. This is often used in onPause() to determine whether the activity is simply pausing or completely finishing. // parent, which in this case is the Activity! Here is a solution using Application class. If you have a reference to the required Activity or using the canonical name of the Activity, you can find out whether it's in the foreground or not. This solution may not be foolproof. Therefore your comments are really welcome. I think this is the reliable way to track activities visibilty. Would Activity.onWindowFocusChanged(boolean hasFocus) be useful here? That, plus a class-level flag, something like isFocused that onWindowFocusChanged sets, would be an easy way to tell at any point in your activity if it is focused or not. From reading the docs, it looks like it would properly set "false" in any situation where the activity isn't directly in the physical "foreground", like if a dialog is being displayed or the notification tray is pulled down. Not the answer you're looking for? Browse other questions tagged android android-activity dialog activity-finish or ask your own question. Android: how do I check if activity is running? Can a custom View know that onPause has been called? How to check if an activity is running in background/foreground from a service? Can I update the UI of an activity which is in background?